Plaque given to award winners from the Historical Society of Michigan. Aaron (right) and Gary accepting the award given to us by Historical Society of Michigan's Board of Trustees President Robert Myers from St. Joseph, Michigan. Gary giving a few "Thank Yous" after accepting the award in Kalamazoo's incredible downtown historical museum. Gary (left) and Aaron displaying their awards. Gary and Aaron standing beside Michigan State University Press' Assistant Director and Editor-in-Chief Julie Loehr. Michigan State University Press did very well at the state history awards, as two other offerings from the press received state history book awards. We are excited and proud to announce that Community in Conflict has won a 2013 Historical Society of Michigan Book Award. This award, given yearly to Michigan's best historical publications, cements the fact that Copper Country history and the 1913-14 Michigan Copper Strike are worthy of statewide recognition. Aaron and I are excited that we were able to bring this history forth, while honoring those that were historical actors in the strike. Historical Society of Michigan director Larry Wagenaar commented that this year's field of nominees for the award was top notch, and that picking winners was difficult. Aaron and I are certainly honored that the book was chosen, and thank Michigan State University Press and Julie Loehr of MSU Press for nominating the book, and the Historical Society of Michigan for choosing the book as an award winner. 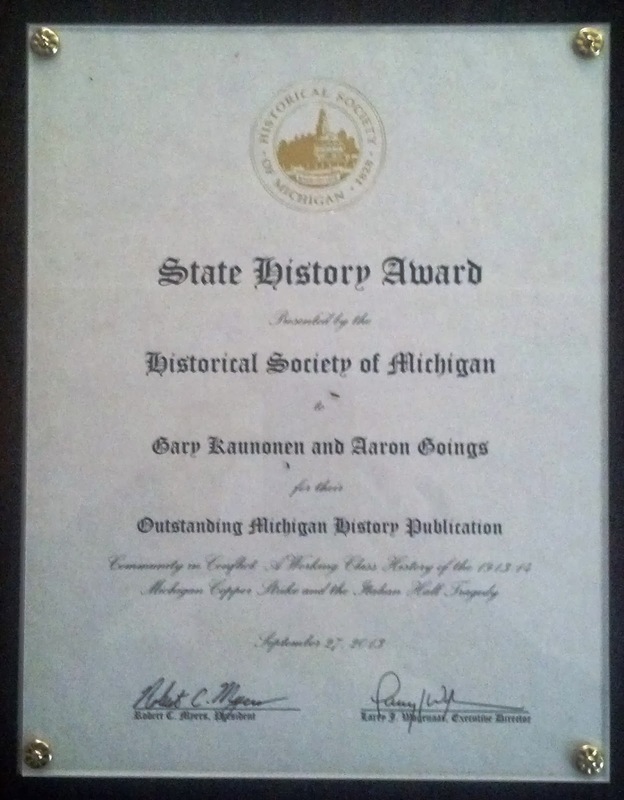 Written by Aaron Goings and Gary Kaunonen and published by Michigan State University Press, “Community in Conflict: A Working-Class History of the 1913-14 Michigan Copper Strike and the Italian Hall Tragedy” received a State History Award as well. Goings and Kaunonen focused their efforts of the Michigan copper strike that received national attention and was a major struggle between labor and management. The strike was overshadowed, though, by violent incidents such as the Italian Hall Tragedy, in which dozens of workers and working-class children died. Goings and Kaunonen utilize previously unused sources such as labor spy reports, union newspapers, coded messages, and artifacts to shed light on this labor event.